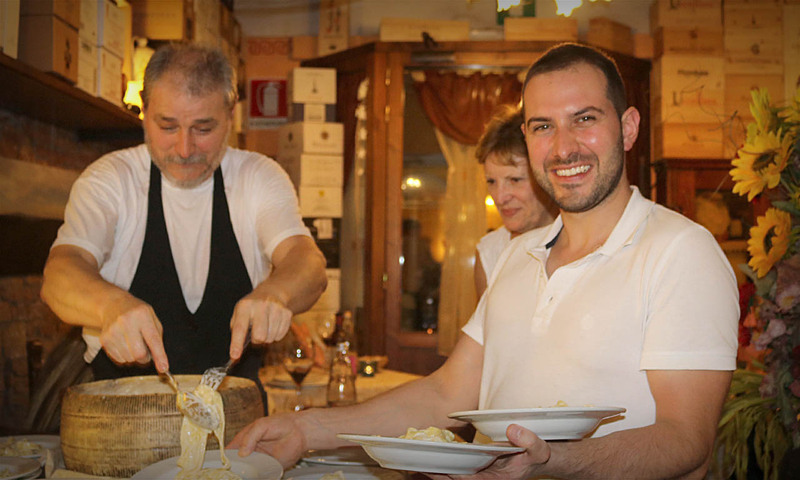 At Ristoranti 13 Gobbi, you'll savor tagliatelle cacio e pepe tossed in a hollowed out Pecorino wheel. Take home the recipes and skills for making handmade pasta. 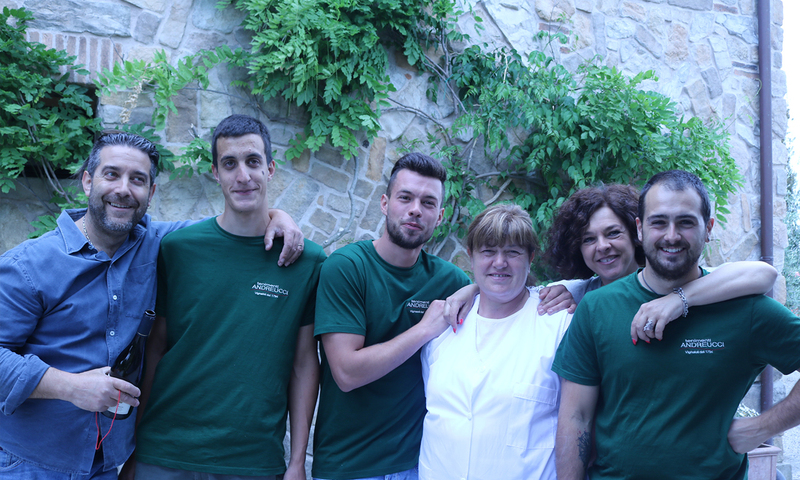 Learn from the local women chefs like Donatella cooking up unbelievable dishes. What’s more fun? Rolling the fresh ravioli pasta sheets or filling the delicious pasta pillows? 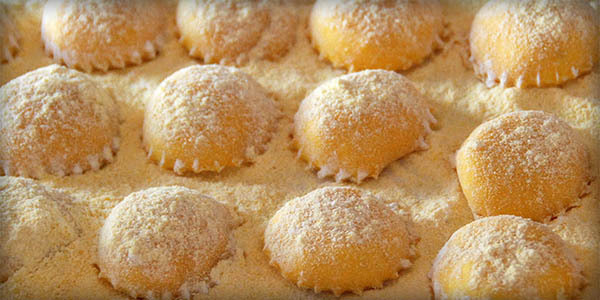 The only thing better than making fresh ravioli is EATING fresh ravioli! 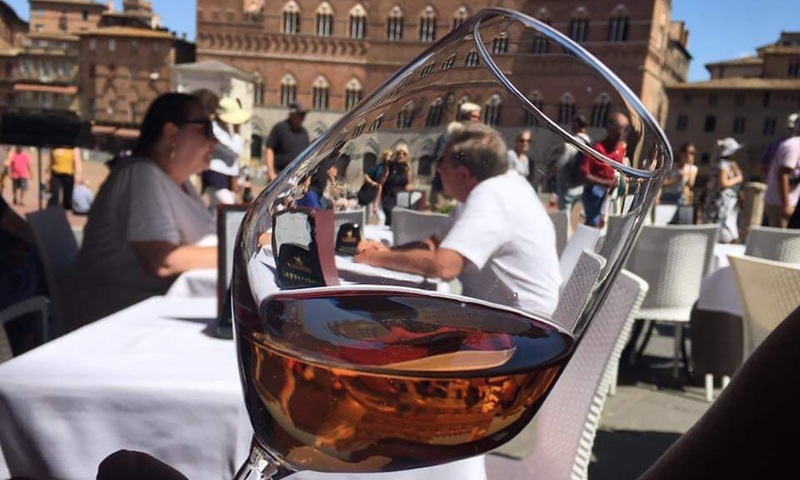 Enjoy an after-lunch glass of Vin Santo following your culinary and cultural tour of Siena. Enjoy chef Lorella's lunch class with Andreucci winery's special wines. We make panzanella, gnocchi, and ricciarelli cookies. Ah Gelato! A sweet treat in every village we visit. Rhonda knows all the best gelaterias. 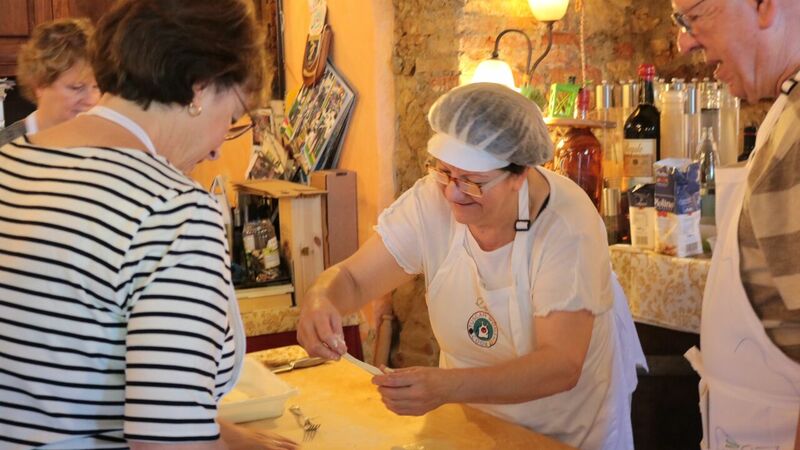 Your week with Tuscan Women Cook includes six night’s accommodation in Montefollonico, breakfast, lunch, and dinner every day, cooking classes, daily sightseeing, visits to local artisans, and wine tastings. Full translation is provided at all classes. Transportation to all activities is in a Mercedes minibus with private driver. Arrive in paradise! Check in at an historic hotel in the medieval walled village of Montefollonico . We will share antipasti and a glass of Prosecco together before our first dinner tonight at a charming local restaurant. 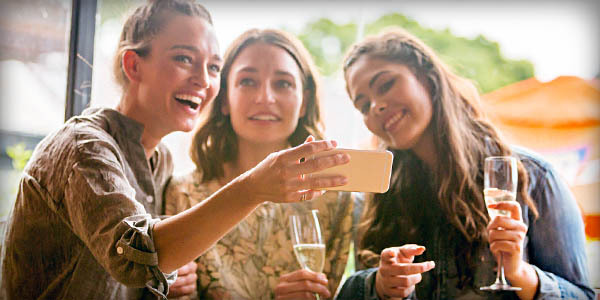 Make a toast to new friends and new flavors. The chef will prepare a delicious Tuscan meal for us to begin our week together. Let the delicious journey begin. Monday (Lunedi): Ready, Set, Mangiamo! It’s time to get cooking! 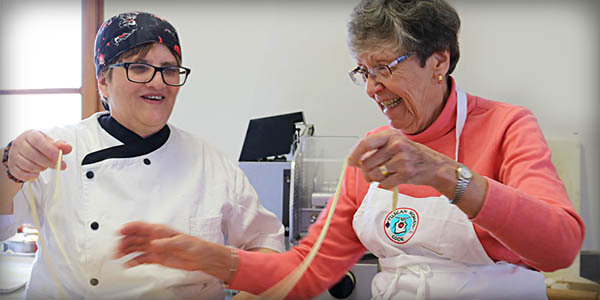 Your adventure begins in la cucina with one of our nonnas. Learn essential foundational Tuscan cooking techniques as you help prepare chicken alla contadina, “white” ravioli stuffed with farm-fresh ricotta, Pappardelle, and caramel gelato with strawberry flambé. 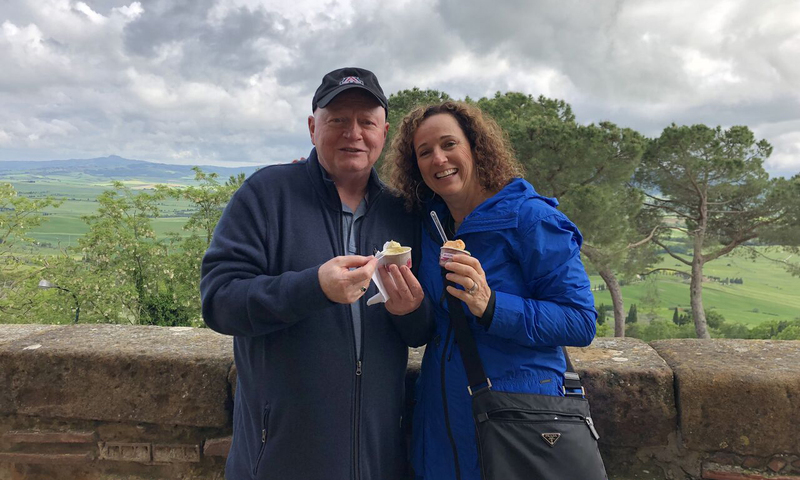 After this extraordinary lunch, you’ll wind through the historic medieval hilltop village of Pienza (named for the 15th century Pope Pius II) to peruse the galleries of many of the local artisans. You’ll experience first hand the role Pecorino cheese from Pienza plays in the dishes you’ll enjoy at Tuscan Women Cook. Tonight you’ll dine at the Cantina de La Porta Monticchiello. Our sommelier for the evening will offer carefully curated wine pairings from Montalcino for your sumptuous meal. Mangiamo! Join us for a cappuccino in the village of Montefollonico before this morning’s cooking class at 13 Gobbi. Simonetta and Donatella will teach us today. 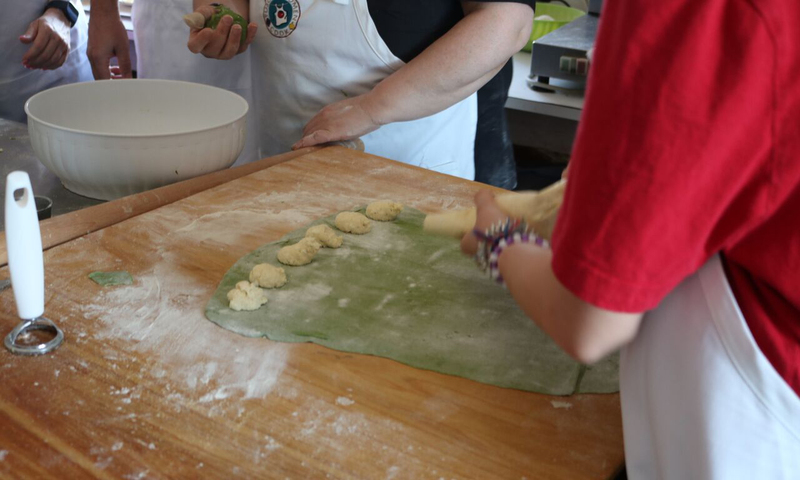 Cooking class this morning features hand-rolled pici, the delicious eggless pasta that originated in our area of Tuscany. 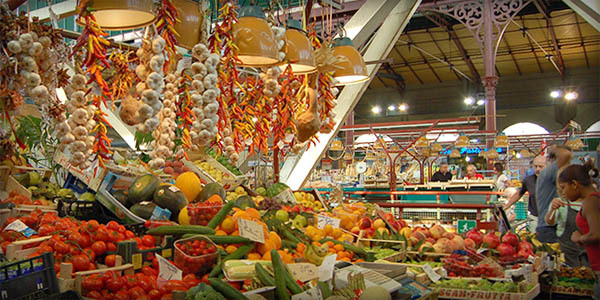 We will also prepare aglione (garlic and tomato) sauce, pollo diavalo, savory grilled fresh vegetables topped with local extra virgin olive oil, and crostata suisina. This afternoon we visit the medieval hill town of Montepulciano where the famous Vino Nobile wine is produced. One of the most sought after ceramic shops in southern Tuscany is in our village. We’ll visit artisan Mariella Spinelli at this incredible shop located in our village’s oldest restored and desanctified church. Dinner will be at the renowned Ristorante La Grotta in Montepulciano, near San Biagio church with the same plan used for the original design by Bramante and Michelangelo for St. Peter’s Basilica. Keep your apron in your hotel room. No cooking lessons today. We depart after breakfast for a day of touring Siena. Joining us will be Dottoressa Cristina Amberti (Laurea = Ph.D.), your guide for our day in the beautiful medieval city of Siena, will provide an expert insider’s introduction to the Gothic architecture, the famous Piazza del Campo, the history of the contrade, and, of course, the vibrant public markets and culinary traditions. Built between the 14th and 16th centuries, Siena is a magnificent medieval city that had a huge impact on art, architecture, banking, and urban planning during the Middle Ages in Italy and throughout Europe. Cristina gives us an exciting insider’s overview before setting us loose at the weekly open air market where shoppers will delight in a dazzling array of booths featuring leather goods, jewelry, clothing, local foods, and artisanal crafts. After our Siena shopping adventure, Cristina leads us on a memorable tour filled with fascinating information about Siena, past and present. 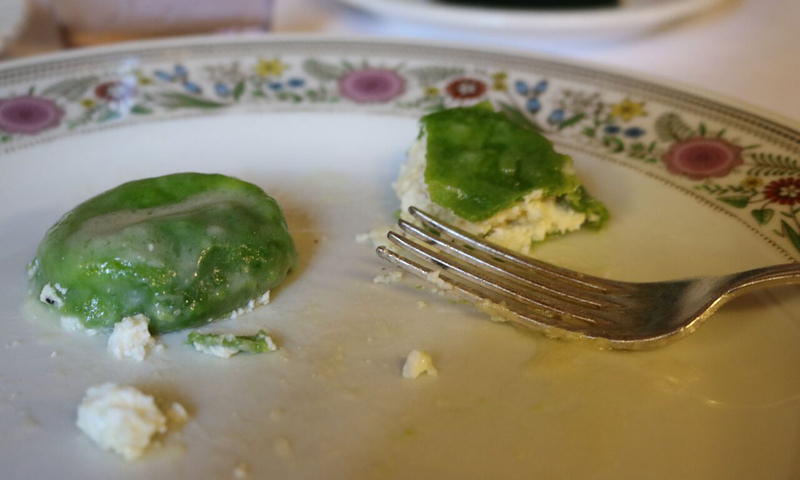 You’ll enjoy an elegant lunch at Osteria Le Logge, one of Siena’s finest restaurants. After lunch, Cristina leads us on more sightseeing, a welcome opportunity to explore even more of this glorious city. Back to our home base of Montefollonico, the best local pizza is featured for dinner tonight. Local favorites baked to perfection in a hand-built wood-fired oven. The white pizza topped with fresh porcini mushrooms and a shaved truffle is one of our favorites. Mangia! Later in the day, we will join local wine master, Vittorio Innocenti, for a wine tasting in his 750-year-old cantina. 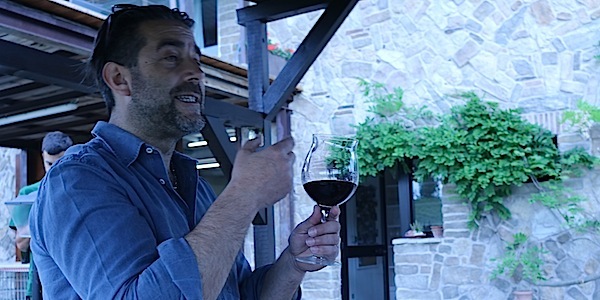 Vittorio is famous for his Vino Nobile di Montepulciano and his award-winning Vin Santo. Dinner tonight is at another of our wonderful restaurants in Montefollonico, La Botte Piena (“the full barrel”). The owners are affiliated with the Slow Food movement and will give us an incredible Tuscan family style dinner with wines. Today is spent at the gorgeous Andreucci winery with a family-style cooking class by Lorella and Lara. We will pair our meal with their award-winning Super Tuscans and outstanding whites, in an afternoon led by Flavio Andreucci of Tenimenti Andreucci Winery, who was recently honored at the Waldorf Astoria Hotel in New York City for his outstanding wines. For our final dinner together, you will enjoy a seven-course degustazióne dinner with outstanding Tuscan wines, including the world-famous Brunello di Montalcino.